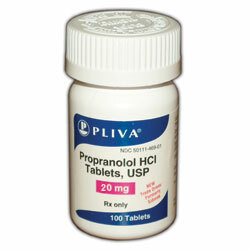 Propranolol is a synthetic pharmaceutical drug that is used to treat hypertension, tremors, and prophylaxis of migraine and heart attacks. The drug is useful in the treatment of complications related to the high blood pressure, hypertension, myocardial infarction and irregular heart rhythms. Propranolol is also prescribed for the treatment of pheochromocytoma (tumor of adrenal glands), proliferating infantile hemangioma and hypertrophic subaortic stenosis. The drug is recommended for the prevention of angina (chest pain), migraine headaches, ascites (accumulation of fluid in the abdominal cavity) and esophageal variceal bleedings. Chemically, Propranolol belongs to the class of organic compounds which are known as Naphthalenes, available as a monohydrochloride salt and named as 1-(naphthalen-1-yloxy)-3-[(propan-2-yl) amino] propan-2-ol. The drug Propranolol is commercially available as tablet, extended-release capsule for oral administration and solution form for oral as well as IV administration. The tablets are available in different dosage or strengths of 10, 20, 40, 60 and 80 mg; capsules in strengths of 60, 80, 120 and 160 mg whereas solution is available in two different dosages of 20mg and 40mg/5mL. Losartan belongs to a class of drugs known as angiotensin receptor blockers (ARBs). Losartan is available as a potassium salt of losartan, a non-peptide angiotensin II antagonist. The drug was the first angiotensin II antagonist to be marketed. Losartan is a prescription medication that is used for treating hypertension either alone or with other blood pressure medicines; reducing the chance of stroke in patients suffering with high blood pressure and left ventricular hypertrophy (an enlargement of the walls of the left chamber of the heart) and delaying the progression of diabetic kidney disease (diabetic nephropathy) in patients suffering with type 2 diabetes who have or had high blood pressure. Besides, the drug also finds implication in the treatment of myocardial infarction, systolic dysfunction, congestive heart failure, and coronary artery disease in patients who cannot tolerate ACE (angiotensin-converting enzyme) inhibitors. 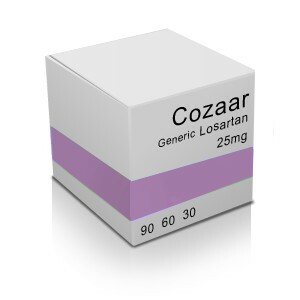 The drug is marketed under generic name Losartan and brand name Cozaar. Losartan chemically belongs to the class of organic compounds which are known as biphenyltetrazoles and derivatives. Losartan (potassium) is chemically known as 2-butyl-4-chloro-1[p-(o-1H-tetrazol-5-ylphenyl)benzyl]imidazole-5-methanol monopotassium salt. The drug Losartan is commercially available in the form of tablet for oral administration. The tablets are available in different dosages or strength of 25, 50 and 100 mg which respectively contain potassium in following amounts: 2.12 mg, 4.24 mg and 8.48 mg.
Propranolol is a non-selective, competitive blocker of beta (1)-adrenergic receptors. The drug competes with sympathomimetic neurotransmitters such as catecholamines. Catecholamines including Dopamine, Norepinephrin and Epinephrine are released by adrenal gland under physical and emotional stress. Propranolol competitively binds with beta-adrenergic receptor and inhibits the sympathetic stimulation which results in reduction in resting heart rate, systolic and diastolic blood pressure, cardiac output and reflex orthostatic hypotension. Losartan, an antihypertensive agent brings about competitive and selective inhibition of binding of angiotensin II to angiotensin I (AT1) receptor present in a variety of tissues including vascular smooth muscle and the adrenal glands. Angiotensin II (acts as a vasoconstrictor in vascular smooth muscle) is synthesized from angiotensin I via angiotensin-converting enzyme (ACE) and is responsible for stimulating the adrenal cortex to synthesize and secrete aldosterone. Alsosterone in turn brings about a decrease in the excretion of sodium and water while increases the excretion of potassium. Losartan, by blocking the binding of angiotensin II to the AT 1 receptor, results in vasodilatation and decrease in the effects of aldosterone thereby causing decreased vascular resistance and blood pressure. Yes, Propranolol in combination with Losartan represents a valuable addition to the existing monotherapy with either Propranolol or Losartan alone in patients with hypertension. The combination is very safe and no extra side effects occur from taking the drugs individually. Propranolol is a beta blocker and its pharmacological action results in reduced cardiac output and sympathetic activity which complements the effects of renin–angiotensin–aldosterone system (RAAS) associated with Losartan mechanism of action in reducing the blood pressure. Studies indicate a significant reduction in blood pressure in patients (approximately 36%) with type 2 diabetes when a beta blocker (Propranolol) is added to ARB therapy. Randomized, open-label, active controlled trials mainly in pediatric population also indicated for the first time about the safety and efficacy of Losartan add-on BB (beta-blockade) therapy in decreasing the progression of aortic root dilation in comparison to BB treatment alone in patients suffering with Marfan syndrome (MFS, a genetic disorder of connective tissue). The Propranolol and Losartan may interact with other drugs. Therefore, care should be taken when you are taking any prescription or non-prescription medicines and herbal or vitamin supplements. It is advisable that you do not start, stop or change or take any medicine unless you have discussed with your doctor or professional consult. Propranolol and Losartan can be taken together at the same time to treat hypertension. However, the dose should be adjusted by professional healthcare, if needed. Do not use the medicine if you are hypersensitive or allergic to Propranolol or Losartan and any of its ingredients. ARBs (angiotensin receptor blockers) including Losartan are usually the preferred choices for patients in reducing the blood pressure in patients with diabetes as these drugs lower the rate of kidney disease. Other antihypertensive drugs such as beta blockers (e.g., Propranolol) can be dangerous for such patients as it might mask the symptoms of hypoglycemia. The combination of Propranolol and Losartan is not recommended in patients with high cholesterol as beta blockers (such as Propranolol) can increase the level of triglyceride and reduce beneficial HDL. Before taking Propranolol-Losartan combination, tell your doctor about your medical history or any coexisting diseased state. Propranolol-Losartan combination is also effective especially in old people due to high incidence of diabetes and also in African Americans who have severe hypertension which cannot be controlled by the use of single antihypertensive agent.